• From the hottest hits to family favorites, dance to over 40 new tracks including Lean On by Major Lazer Ft. MØ & DJ Snake, Sorry by Justin Bieber, Cheap Thrills by Sia Ft. Sean Paul and many more! • Just Dance Controller app acts as your tracking device and scores your moves! 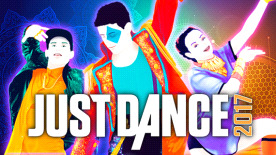 Watch videos on-the-go from Just Dance TV, including dance lessons! • Dance to +200 tracks with Just Dance Unlimited, the on-demand streaming subscription service, and access exclusive new content all year long! • Enjoy 6 game modes including the new frantic “Just Dance Machine”, customize your workouts with “Sweat + Playlists"", or try and beat the game with “Dance Quest”!